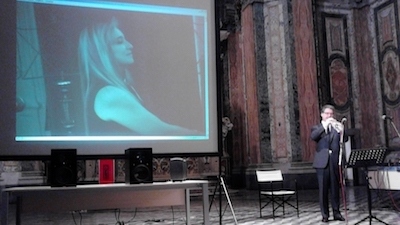 A low latency, high quality audio/video transmission system for network musical performances and interaction developed by Conservatorio di Musica "Giuseppe Tartini" from Trieste (Italy) in collaboration with GARR, the Italian Research and Academic Network. 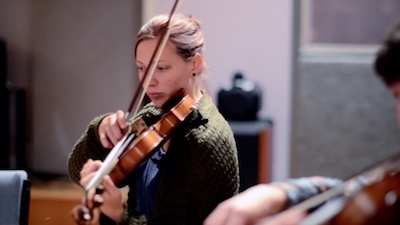 LoLa project aims to enable real time musical performances where musicians are physically located in remote sites, connected by advanced network services, like the ones provided by the NRENs and GEANT and other International backbones. The project motivation comes directly from musicians who are currently engaged into many geographically distributed activities (Concerts, MasterClasses, Teaching, Recording Sessions, etc.) which require them a lot of travel and result in a big time waste. LoLa provides a tool which permits musicians to perform many more rehearsals before a concert, for example, giving them much more time to refine the performance before they join together for the event; they can engage in MasterClasses teaching students around the world even when they are located in distant sites, including the ability to perform together with the student during the lesson, and enabling many more students to participate without the need of travel; they can take part in recording sessions without the need to travel to the recording studio, etc. But LoLa provides also the ability to perform real concerts for the public, with distributed performers, and distributed audience, too. It thus opens a new fully unexplored performance scenario, with new challenges and new opportunities. LoLa is a project developed by Conservatorio di Musica Giuseppe Tartini from Trieste (Italy) in collaboration with GARR, the Italian Research and Academic Network, and was conceived in 2005 after a demonstration of the first intercontinental viola MasterClass between the GARR National User’s Conference in Pisa (Italy) and the New World Symphony music academy in Miami (USA). 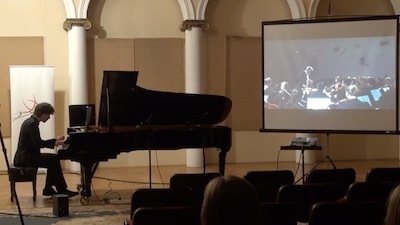 LoLa was first demonstrated in public in 2010, with a piano duo concert between Conservatorio Tartini in Trieste and IRCAM in Paris, and is now deployed in a large number of institutions around the world (LoLa installations), all connected to their national research and education network. The project research and development team is composed by Massimo Parovel (project supervisor), Paolo Pachini (project coordinator), Stefano Bonetti (system designer and lead software engineer since 2012), Carlo Drioli (former system designer and software engineer), Nicola Buso (audio engineering, musical advice and testing) from Conservatorio Tartini, and Claudio Allocchio (network engineering and testing) from GARR. 30/11/2017 - LoLa 1.5.0 RELEASED! Since November 2017, the LoLa development project also established a partnership with XIMEA (www.ximea.com). XIMEA USB3 video cameras have proven on the field to be the technically best, cost effective and more reliable video hardware compatible with LoLa. With this partnership we will be able to tailor even more both the technical camera features needed by LoLa, to provide better users' support and to provide custom interfaces and models: sharing common research will also enable new vision features to further enhance the overall "LoLa experience". In June 2017, Massimo Parovel was awarded the GEANT Community Award Prize, for having conceived the idea of LoLa back in 2005. The Award honors those individuals who shared an idea with the research and education community, and then the idea became an outstanding service for the community itself. This is also a great recognition for the whole LoLa project, which is now helping the world of education, creativity and research, giving unprecedented possibilities to all. Mario Brunello, cellist, in Trieste with Valerio Cossu, Ester Vianello and Angelo Zanin (in Venice), Uršula Ivanuš Iwaki and Erazem Grafenauer (in Ljubljana). Trieste Next 2012, Salone Europeo dell'innovazione e della ricerca scientifica. Music by Vivaldi and Mozart. Aula Magna of Conservatorio di Musica G.Tartini - 29/09/2012. 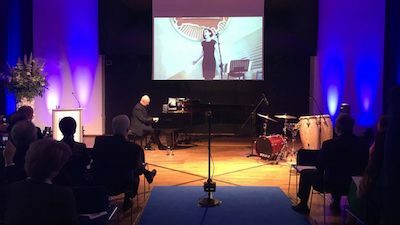 Edinburgh Napier University and the Royal College of Music (RCM) have linked up to demonstrate the power of the Janet network in supporting collaborative performances across remote locations. 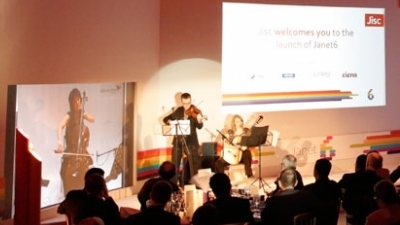 The advanced network, whose latest edition, Janet6, was officially launched by Jisc at an event at the London Film Museum, has been designed to address future demands for high capacity connectivity. 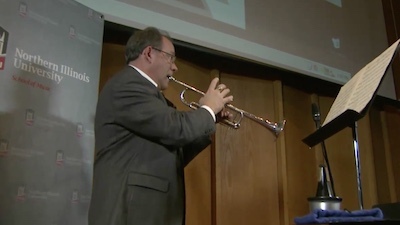 At the launch event, guests were treated to a unique musical performance which saw musicians from both the Royal College of Music, based in London, and Edinburgh Napier University playing simultaneously, in real-time, via audio video streaming using LoLa (LOw LAtency Audio Visual Streaming System) technology. Michael Tilson Thomas leads the Atlanta Symphony Youth Orchestra from Miami via the software application LoLa. 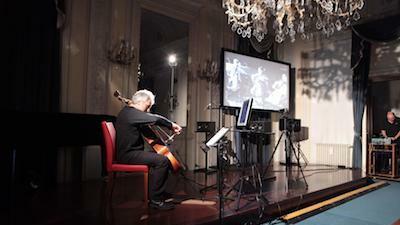 A LoLa ((LOw LAtency audio/visual system) performance at the TERENA Networking Conference (TNC) 2013. LoLa enables musicians and performing artists to interact in a natural way even if they are located thousands of kilometers from each other. Based in Edinburgh Napier University of Music (UK), Stevan Waterman - composer, teacher and trumpet soloist -- performed with Uli Weber (guitar), Sander Baan (sax), Bouke Hofma (drums) and Jelmer de Haan (bass guitar), on stage in Auditorium 2 at the MECC in Maastricht, the TNC2013 venue. Uli and Bouke are from ArtEZ School of Music Conservatorium (Arnhem, NL) and Sander and Jelmer from Prince Claus Conservatorium (Groningen, NL). This project was used to test a real-time, low latency, audio/video conferencing system. This system was used to allow a music teacher to conduct a "live" remote guitar lesson with his student many miles away. 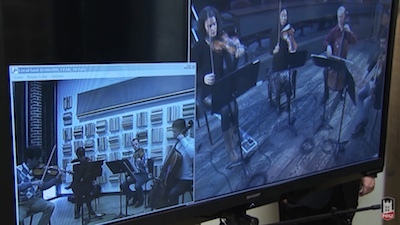 It also successfully allowed musicians at 2 different locations to play the same song together in real-time. The North Georgia Network provided the extreme broadband speeds needed to transfer uncompressed video & audio between the 2 locations. 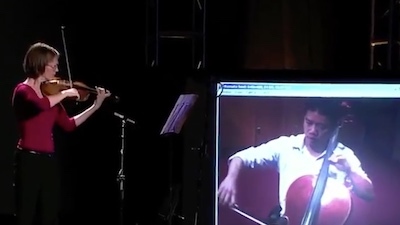 Finally musicians in different locations can perform together real-time! 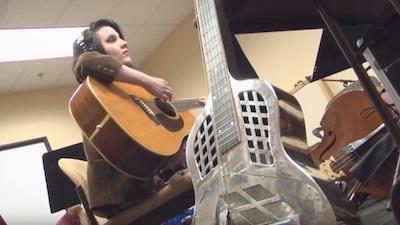 This is an original song called "Down the Columbia" premiered on the LoLa low-latency audio/video conferencing system. The performers were at two locations and separated by approximately 50 miles. The latency between the performers in this video is less than 10 milliseconds, equal to the speed of sound at 10 feet apart. This 10ms delay is imperceptible to the ear and provides a completely natural musical experience for the performers. 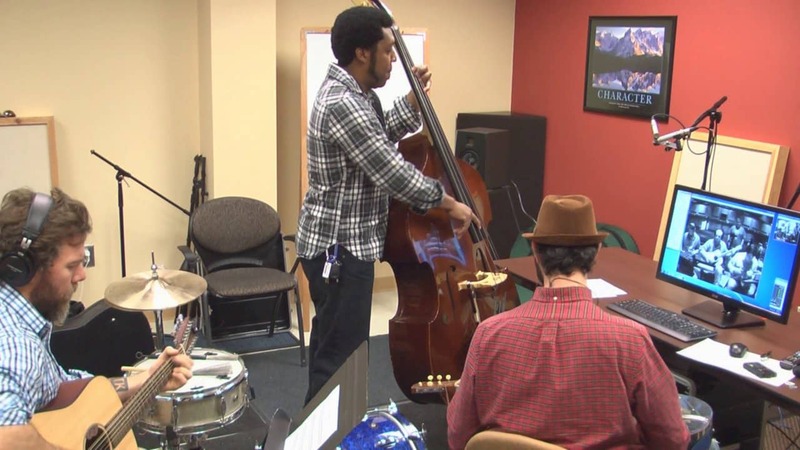 Northern Illinois University demonstrates the power of Internet2 and LoLa as musicians from the NIU School of Music perform with faculty from University of Nebraska-Lincoln. 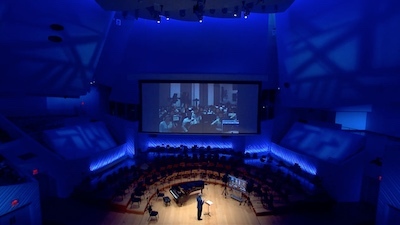 LoLa (Low Latency), developed by GARR and Conservatorio G.Tartini in Italy, is a unique audio-visual streaming technology, which enables musicians to play together in real-time, from different locations, using high-speed networks. 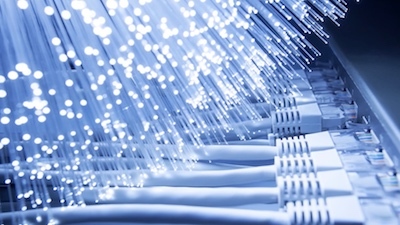 Janet provides a robust, low latency and low jitter connection between two points which is vital for LoLa to work. By virtually removing any delay when data is sent over the network, performances can take place, seamlessly, in real-time. LoLa - a low latency audio video platform allowing for real time connections to take place between performing artists at distances of up to 1000 kilometers or more. 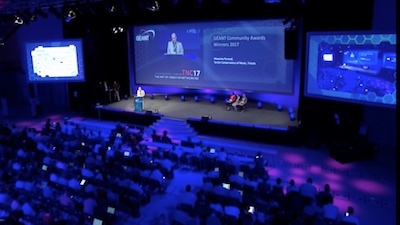 Three GÉANT Community Awards were presented to winners during the opening plenary session of this year's networking conference, TNC17, in Linz, Austria: to Hannah Short, Massimo Parovel and jointly to Tomasz Wolniewicz and Maja Górecka-Wolniewicz. The 2017 Community Awards were presented on behalf of the panel of judges by Christian Grimm – chair of the GÉANT Board of Directors – and Christian Panigl – host of TNC17 and chair of the TNC17 Programme Committee. The NIU School of Music believes the capabilities of Internet2 and LoLa will increase educational opportunities for students. LoLa was introduced in a concert “Music without Borders” on 5 October that served as an introduction to the 2nd Eastern Partnership Ministerial Meeting on Digital Economy featuring top musicians from Tallinn and Minsk, Belarus, who performed together in real time. Among them were Rector of the EAMT, pianist Ivari Ilja, Vice-Rector of the EAMT, cellist Henry-David Varema, jazz pianist Kirke Karja and singer Laura Põldvere. 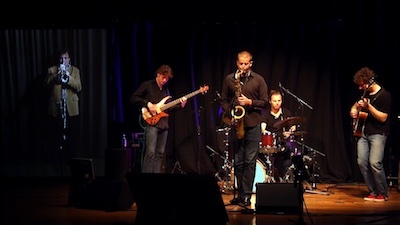 The Estonian musicians were joined in Minsk by a number of Belarusian and Georgian musicians such as renowned jazz saxophonist Reso Kiknadze, Rector of Tbilisi State Conservatory. LoLa is a licensed software and it is available for free for all academic and education non profit uses. In all other cases, it has a shareware license to support the project. Please contact us (Conservatorio Tartini as the IPR owner and GARR as its Agent and Representative) via email at lola‑project@garr.it to receive the appropriate license and for any further detail or information you may need. When we will receive via email the scan of your filled in and signed license (just the last page is enough) we will generate your license code and your login credentials, so you can access the restricted area of this site and download the installation kit and other items. You will also be added to lola-users@garr.it mailing list, which is the discussion area for all registered LoLa users. You should also be aware that in order to use LoLa you need a very specific hardware (we will also give you all the needed info) and a good and stable network connection: at least 1Gigabit clean path between locations, and this is something that currently no commercial provider can deliver: only academic and reseach networks can deliver this network service, and this network service is a fundamental componet of LoLa itself. Using m-jpeg compression, LoLa is also usable at lower speeds (but we suggest at least 100Megabit) and also in this case you need a commercial ISP which can deliver a clean and symmetric connection to make LoLa work properly.